Tour provides assistance, encouragement, and helpful tips. Adventist World Radio (AWR) leaders recently visited Adventist radio stations in France to provide assistance and encouragement and to exchange ideas. The visit took place on January 13 and 14, 2019. 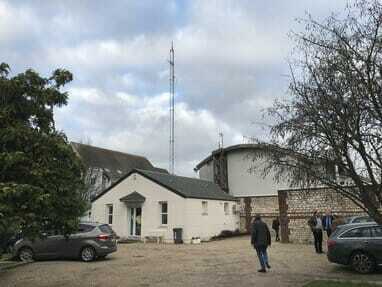 Six radio stations in France are managed by the Seventh-day Adventist Church. The stations are led by paid staff and a small army of volunteers. Radio stations are coordinated by the communication department of the French-Belgian Union (UFB) church region, under the leadership of radio manager Stephan Vincent. The visit was coordinated by Inter-European Division (EUD) communication director Corrado Cozzi and included AWR vice-president and CFO Kent Sharpe and AWR Europe liaison Vasili Makarchuk. The group visited the radio stations Le Havre, Radio Albatros, Ruan, Radio La Sentinelle, and the radio studio at the UFB headquarters. “Thanks to the visit of AWR officers, local radio stations got new ideas and helpful tips that have worked in different countries, to advance the radio work,” Torres said. The visit has been received very positively by the leaders of the radio stations, UFB leaders said, and it was an exchange of input that allowed AWR officers to better understand the challenges that radio stations have in the European context. Makarchuk said the visits were very positive. “It was a great pleasure and enormous blessing to meet for the first time all the dedicated radio members at Radio Albatros and Radio la Sentinelle stations. Well done!” he said.